Ticketor Prices - Sell Tickets on Your Own Website and Reduce Your Cost! We are proud to offer the best rate in the industry while offering the most feature-full, flexible and reliable product with great customer support. Ticketor charges 2.5% + $0.00 (or 2.9% + $0.49 per ticket) depending on the plan you choose. The Standard plan charges 2.9% + $0.49 (per ticket) and has no setup or monthly fees. 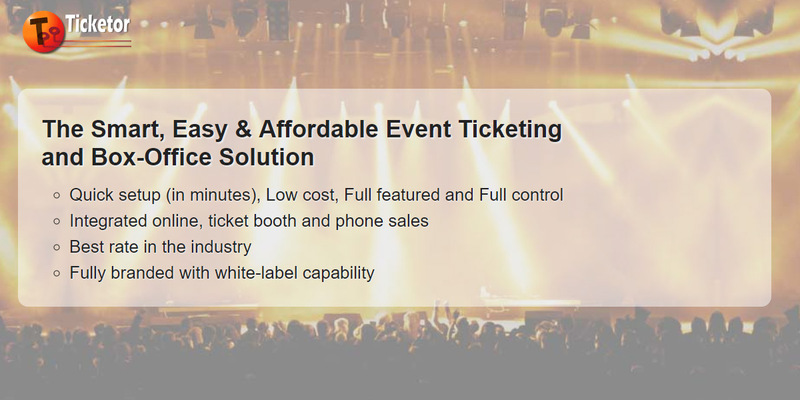 It offers all the ticketing features including unlimited events and venues, seating charts, e-tickets, barcode scanning, real-time reports, your custom design and logo, and great customer support. The Premium plan charges 2.5% + $0.00 and has a small monthly and setup fee. This plan offers additional features such as custom URL (white-label), website builder and analytics. Unlike most ticketing platforms, there is no flat charge per ticket and no hidden fees. You can transfer none or part or the entire fee to the customer by setting the service charge as you are the one who sets and keeps the service charges. You can even set the service charge to a higher amount and make extra revenue. There is no long term contract and no cancellation fee. So you can cancel or upgrade/downgrade your plan at any time. If you are considering Premium plan, committing to 1, 2, or 3 years, will reduce your monthly fees compared to month-to-month plan. Q: You advertise: "ZERO charges to you!" and "You have full control over charges!". How does it work? Ticketing service: A fee that is charged by the website or service you use to sell tickets. Ticketor charges the most competitive fee of 2.5%. You may transfer all or part of it to the buyer. Credit Card Processing fees: A fee charged by the payment processor or PayPal to process the payment. Since you use your own payment processor/PayPal with Ticketor, you pay the charge directly to them. Ticketor is not involved in this fee, however you can transfer all or part of this charge to the buyer. Delivery charges: A fee charged for delivering tickets by mail, will-call, or print at home tickets. Ticketor does not charge for any delivery method. However you may decide to charge your buyers. Some ticketing services may charge YOU (the event planner), for the fees, while some others may advertise that it is free for you and in this case they charge the buyer for the fees. Since Ticketor, builds you the ticketing website, we leave the decision totally to you. You may decide to pay the fees by yourself, or transfer all or part of it to the buyer. You can even charge extra and make money of your ticketing service. You decide how much you want to charge the buyer for each ticket type in each event. Q: You advertise: "Not only you don't pay anything for ticketing, but also you can make money out of your ticketing service!". How does it work? When you as an event planner sell your tickets on a 3rd party website, that website makes money by charging either you or the buyer or both. Now that you own your ticketing website, you can decide to charge the buyer, anything over your cost and this is how you make money. * Your merchant fee may vary but is usually in the same range. Contact your service provider for the accurate rate. So if you charge the buyer a service-charge of $0.55, you break even. But most ticketing services charge much more, why not you? Ticketor allows you to charge as much or as less as you want. If you decide to charge $1.50 for each ticket, you will make $0.95 on each ticket sold. Q: When and how does Ticketor charge me? Monthly fees (if any) will be billed on a monthly basis. Transaction fees are due when a sale happens, however depending on your payment processor it may get collected later. If your payment processor supports "Application fees", the Ticketor fee will be deducted from each sale. If not, Ticketor will bill you either on a monthly basis or when your balance exceeds certain amount. Q: How does Ticketor offer such a low rate of 2.5%? While most ticketing websites charge much higher fees for selling tickets, Ticketor offers the most competitive price by allowing you to build your own website. It leaves you lots of room to charge extra and make money. Q: What happens if I want to switch between plans or add/remove features? You can switch between plans or add/remove features at any time, and at no extra cost. Q: What if I want to cancel my account? You can cancel at any time. There is no cancellation fee and no long-term contract. or anything over, to make profit. Integrate your website with social media and Facebook and leverage the power of them to reach to more customers. Integrate your website with Google Analytics and monitor your website traffic. Google Analytics let you know who are the users are your site? From what country/city? What demographic? From what website did they get to your site? What keywords did they search to get find your site and many more valuable information. You will also need to register for Google Analytics to make use of this feature. Allows you to add unlimited number of content pages including photo albums, video gallery, text and html pages, blog and news pages. Sell memberships, hotel packages, CDs, DVDs, T-Shirts and other merchandise on your website. The store-online feature allows you to create a store page, add merchandise and sell them online. The same transaction fee that applies to tickets, apply to merchandise sold through the online-store. ** Event by event accounts are subject to cancellation if there is no event for sale or website does not make any sale in any 90 days. You can use Ticketor either in "Self-Service" or "Full-Service" mode. Self-Service mode: You or your team will be in full control over your events and tickets. You will create events, add / remove tickets, etc. Our step-by-step, easy-to-follow tutorial, will teach you everything you need to know and basically it is as easy as creating an event on Facebook. Our support team will help you out if you encounter any problem to make sure you are able to use every feature of your site. Full-Service mode: Ticketor support team is responsible for creating events, adding / removing tickets and customer support based on the information you provide to us. I want to design the site with my logo, branding, theme, etc. I need a full site (not only a ticketing site) that I can manage and update easily without help of a professional. A site where I can have my photo albums, videos, blog, news with an online store on my domain. I need a small online-store to be able to sell my merchandise like CDs, T-Shirts, membership, etc.